As events unfolded on Monday in Blacksburg Virginia, I felt a familiar hollowness in my chest. That sinking empty feeling, like something palpable dropping somewhere deep inside me brought about a frightening sense that I had been here before. Eight years ago yesterday, I remember sitting in English class when I heard the door open. A school administrator left a letter with my teacher, said something into his ear and then left the temporary building, locking the door behind her. We all craned our necks to look out the window and saw a squadron of police patrolling the walkway outside. Eric Harris and Dylan Klebold had just finished their terrible rampage at Columbine…we were one of the nearest high schools. Life in Jefferson County changed that day. I remember flying kites on April 21, 1999. My friends Sarah, Jed, and I had nothing else to do. School was canceled for the rest of the week. I remember thinking how strange it was to fly a kite, to watch a beautiful bright piece of fabric play on the breathy wind. Kites are flown in times of celebration and on sunny summer carefree days…these days were heavy laden. Those few days off from school were difficult, but also some of the most wonderful moments I can remember. In the midst of the horror, we reached out for one another and felt the depth of friendships, family, and community. We spent time together in prayer, time laughing, time flying kites. We were forced to stop and consider what happened and what mattered. Wednesday night, I had the privilege of working with people from around UCSD to bring students together for a Vigil for Virginia Tech. Taking a very simple moment to come together in this time of grief brought me closer to my new University home than I have felt all year. 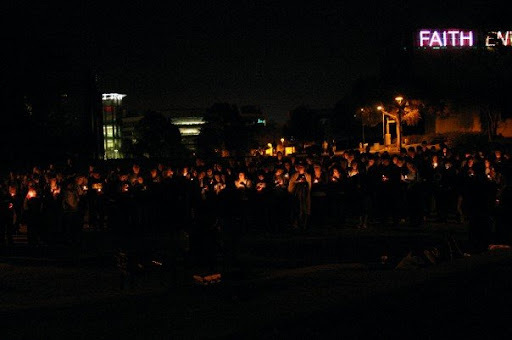 We remembered all of those who suffered because of the violence at Virginia Tech. We have a God who came to be with those who suffer, who entered fully into the human experience even surrendering to a humiliating and excruciating death. In those last moments on the cross I have to think Jesus experience that same sinking feeling. “How God, how could you let this happen. Why have you forsaken me.” Jesus KNEW the painful isolation we feel from our fellow human beings and from God when such great tragedy occurs. He also gave us the supreme example of reaching out to others in love. May we reach out in love to one another, that no one may feel alone in this time.